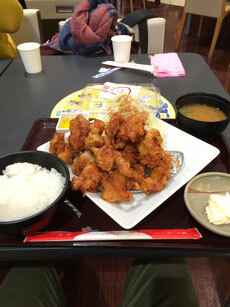 A ton of Japanese tasty fried chicken KARAGE at Tonkichi Aeon Chaya food court!! It is called ``Karage Mountain``, Karage means groed chicken. We shared and enjoyed really ! It is 899 yen included a ton of fried chiken, scheamed rice, miso soup, sliced cabbage, picles and mayonase. The shops are in Aeon Mozo (near Kamiotai station Thurumai lline), Aeon Tikoname (near Linqu Tokonema station Meitethu Tokoname line) and Aeon Chaya ( a bit far from any station but there is shatle buses from Nagoya Station).